Everton Want This £25m Rated Dutch Star: Ideal Man To Lead The Midfield? Everton had an unsatisfactory season, to say the least in the recently concluded season in the Premier League, which has led them to rethink about their team composition and bringing in quite a few players who can turn the tide in their favour in the next term and help them challenge for the Top 6. Ronald Koeman, the Dutch mastermind who is the man in charge at the Merseyside club is much impressed with the current captain of Dutch Eredivisie club Ajax, Davy Klaassen, and has been looking to bag him for the next season. The Dutchman has been the star of his team for the last few seasons and played a key role for his side to make them reach the final of the Europa League last season. After a season that has managed to impress a number of big name clubs from all over Europe, Klaassen has been entitled to a move that might be helpful for his career in the forthcoming summer transfer window. 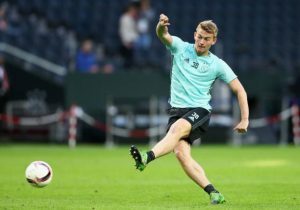 Everton have been one of the clubs who desperately want the Dutchman to be a part of their line-up and empower their midfield in the new season. With their star player on the verge of leaving the club, Ajax are also looking to keep hold of their prized possession for the next season. However, having spent a considerable amount of his career at the Dutch club, Klaassen is now looking to make a move out of Ajax, and it is very unlikely for him to spend another season in the Eredivisie. In the case of Everton, they are also entitled to lose one of their best players in the midfield, Ross Barkley, who might make a move out of Goodison Park in the summer. This will lead to the creation of a big gap in the midfield for the Toffees and Klaassen can be the perfect solution to that, given he sign for the Merseyside club in the summer. Reportedly, Ajax have slammed a price tag of £25 million on their captain, which might not affect the interest of Everton to make a move for the highly-rated midfielder. The 24-year-old is known for his box to box presence in the midfield and has the ability to intercept passes played in between two opposition players. He is also known for his strong presence in the midfield and can play pinpoint passes to the players in the attacking third. He is equally devastating from both open play and set piece situations and can be a real threat to the opposition. Barcelona Planning A Mammoth Bid For This Italian Maestro: Can He Turn Around Their Fortunes? Pep Ready To Spend: But Do Manchester City Really Need This £50m Star? Crystal Palace Choose To Target This Sensational Dutch Defender: Has De Boer Made The Right Call? Should Chelsea Go For This £12m Rated Dutch Midfielder in January? West Ham United Ready To Splash £17m For This Chelsea Attacker: A Wise Move By Bilic?